While Axio Biosolutions has developed homestatic dressing using chitosan extracted from shripmp shells, Advancells is working on Stem cell Therapy. Times are changing for the Indian healthcare research and development (R&D) segment. While Axio Biosolutions has developed homestatic dressing using chitosan extracted from shripmp shells, Advancells is working on Stem cell Therapy. Among the niche start-ups bringing bleeding-edge medical breakthroughs from research labs to market are Axio Biosolutions and Advancells. 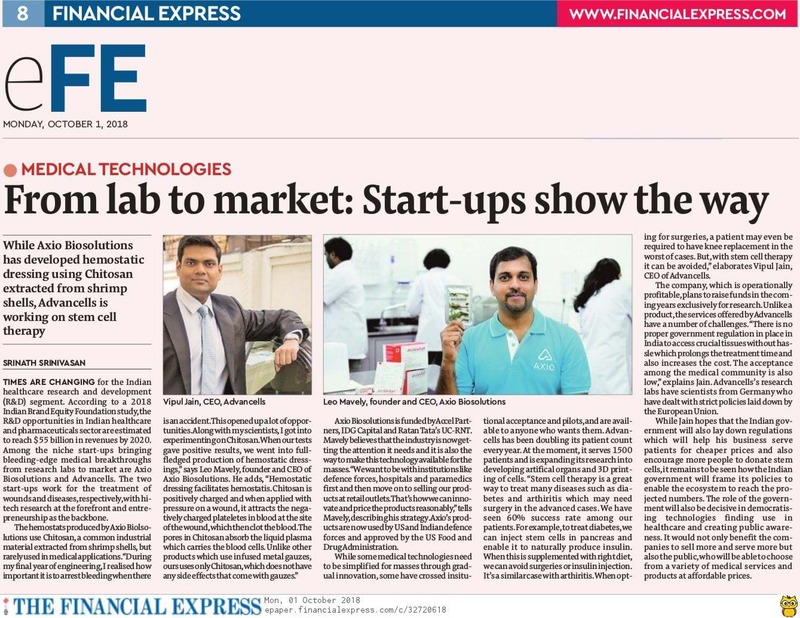 The two start-ups work for the treatment of wounds and diseases, respectively, with hi-tech research at the forefront and entrepreneurship as the backbone. Axio Biosolutions is funded by Accel Partners, IDG Capital and Ratan Tata’s UC-RNT. Mavely believes that the industry is now getting the attention it needs and it is also the way to make this technology available for the masses. “We want to be with institutions like defence forces, hospitals and paramedics first and then move on to selling our products at retail outlets. That’s how we can innovate and price the products reasonably,” tells Mavely, describing his strategy. Axio’s products are now used by US and Indian defence forces and approved by the US Food and Drug Administration. While some medical technologies need to be simplified for masses through gradual innovation, some have crossed insitutional acceptance and pilots, and are available to anyone who wants them. Advancells has been doubling its patient count every year. At the moment, it serves 1500 patients and is expanding its research into developing artifical organs and 3D printing of cells. “Stem cell therapy is a great way to treat many diseases such as diabetes and arthiritis which may need surgery in the advanced cases. We have seen 60% success rate among our patients. For example, to treat diabetes, we can inject stem cells in pancreas and enable it to naturally produce insulin. When this is supplemented with right diet, we can avoid surgeries or insulin injection. It’s a similar case with arthiritis. When opting for surgeries, a patient may even be required to have knee replacement in the worst of cases. But, with stem cell therapy it can be avoided,” elaborates Vipul Jain, CEO of Advancells. The company, which is operationally profitable, plans to raise funds in the coming years exclusively for research. Unlike a product, the services offered by Advancells have a number of challenges. “There is no proper government regulation in place in India to access crucial tissues without hassle which prolongs the treatment time and also increases the cost. The acceptance among the medical community is also low,” explains Jain. Advancells’s research labs have scientists from Germany who have dealt with strict policies laid down by the European Union. While Jain hopes that the Indian government will also lay down regulations which will help his business serve patients for cheaper prices and also encourage more people to donate stem cells, it remains to be seen how the Indian government will frame its policies to enable the ecosystem to reach the projected numbers. The role of the government will also be decisive in democratising technologies finding use in healthcare and creating public awareness. It would not only benefit the companies to sell more and serve more but also the public, who will be able to choose from a variety of medical services and products at affordable prices.